Check these pages. 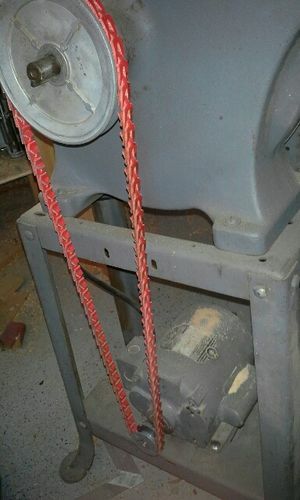 Lots of documentation on older Delta bandsaw, Exploded parts diagrams, Instruction manuals. Hope this helps on removal and replacement. Bearing supplier may be able to match older bearings. Harbor Freight has a bearing pullers. I found I reduced the vibration by going to a link belt on my old Delta 14. The bearings were not hard to replace. I use it every day the old blade guides work very well. Bad bearings will cause vibration.. as will bad tires or a bad blade. Link belts work well to reduce vibration on machines that use the motor weight for tension (like on contractor saws), but not so much on fixed motors. If your belt has taken a set, running if for a while will soften it up. If it’s in bad shape, a new v-belt should be fine and a lot cheaper than a link belt. My saw has 1/2 HP and runs a 1/4” blade works fine. I use a Grizzly 17” wider blade for resawing. I think a 1HP motor is plenty on the Delta 14”. I put rubber washers in back of the wheel guard covers to remove some of the rattle and put a few washers under the blade tension spring due to its age of being compressed. The new poly tires work ok. I put a Krieg fence from Rockler on it and it fit well enough. I tried the white ceramic blade guides Rockler sells but went back with the original steel ones. I paid $150 for the old saw and like it well enough to not replace it now that I can afford to. Mine had a warped pulley. Once I replaced it, no more vibration. I blogged my restore if you’re interested. Almost forgot about your stuck nut problem. Did you ever get it loose? If you can’t hold the shaft from turning using the pulley, try getting a wrench on both nuts, one on the wheel and one behind the pulley, for a little better leverage. They can be stubborn, but will come off. Ditto on the wheel. I have a Delta 28-560. Got the parts listings and break down illustrations at eReplacementParts.com. enter your saw model number when you access the website. Mikestools.com has Delta owner/operator manuals for free down load, got the 28-560 one there. Ozarktoolmanuals.com offers a manual but charges $17.00 for it.